October 25, 2011  Turnout was huge in Tunisia's first democratic election, with almost 90 percent of the population casting their votes. The official results will be announced Tuesday afternoon in the capital Tunis, but there are already signs that the moderate Muslim party has done very well. October 21, 2011  Ousted Libyan leader Moammar Gadhafi was killed on Thursday after being captured in his hometown of Sirte. His death marks a spectacular fall from power that began in February when anti-government forces seized the coastal city of Misrata. October 20, 2011  Secretary of State Hillary Clinton traveled to Afghanistan to encourage the country's leadership to keep up reconciliation efforts with the Taliban. In a meeting with President Hamid Karzai on Thursday, she stressed the U.S. will stay committed to the country long after U.S. troops are drawn down. President Obama waves to the crowd after speaking at a GM plant Friday in Michigan. Obama and South Korean President Lee Myung-bak visited the plant to promote a free trade agreement. October 15, 2011  The president toured a General Motors plant with South Korea's leader Friday in Michigan and spoke to workers about the new agreement. The two leaders tried to address a concern by some that the deal will cause the U.S. to lose manufacturing jobs to overseas workers. 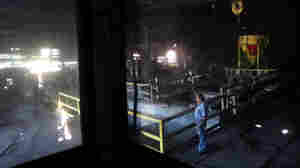 This steel plant in Weirton, W.Va., was idled in 2009. The United Steelworkers union worries that a trade deal signed this week could result in more jobs lost. October 14, 2011  President Obama had a rare bipartisan economic success when Congress passed three trade deals this week. But some important parts of Obama's political base are not fans, which could have political consequences for the president. President Obama speaks about job creation and the economy at the International Brotherhood of Electrical Workers Local No. 5 Training Center in Pittsburgh on Tuesday. October 11, 2011  Ever since President Obama proposed his $447 billion jobs bill in a joint address to Congress last month, he has been campaigning for it nonstop. But Senate Republicans voted Tuesday to kill the measure. Now Democrats hope to consider the proposals piece by piece. October 8, 2011  While people were talking about the religion of former Gov. Mitt Romney at the Values Voter Summit in Washington, Romney was wrapping up a two-day swing through South Carolina. 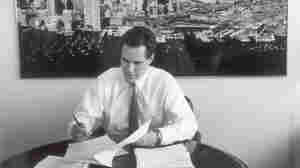 Romney finished fourth in this state's primary in 2008, and his Mormonism was one of the issues seen as holding him back. This time around, there's been less talk about religion and more about policy, but Romney still has a tough row to hoe in this early-voting state. NPR's Ari Shapiro explains why. 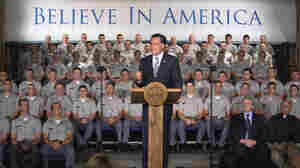 October 7, 2011  In a speech at The Citadel on Friday, the former Massachusetts governor known more for his business acumen than his foreign-policy experience said he wants to increase the military budget. 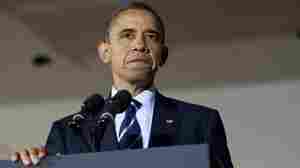 A weaker military and a smaller global footprint, he argued, will compromise America's leadership in the world. 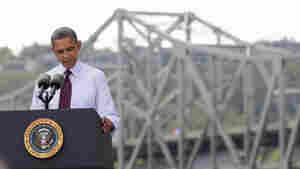 Obama's Jobs Bill Pitch: A Bridge To Nowhere? September 23, 2011  The president traveled to Ohio's Brent Spence Bridge on Thursday to help sell his jobs bill. He says if the country doesn't invest in its infrastructure now, it will pay later. While everyone agrees the bridge is badly in need of repair, Republicans say the president's jobs bill won't get it done. September 21, 2011  President Obama addressed the United Nations General Assembly in New York Wednesday, speaking about the expected Palestinian bid for recognition by the U.N. The president said that peace between Israelis and Palestinians will not come through statements and resolutions at the U.N.